Manti Te’o was being “catfished.” Tuiasosopo carried on Lennay Kekua completely without Te’o’s knowledge. Tuiasosopo orchestrated this hoax for years without Te’o or any of his family members knowing about it and only a few people being the wiser. This makes Manti Te’o cartoonishly gullible—of Kenneth in 30 Rock proportions. 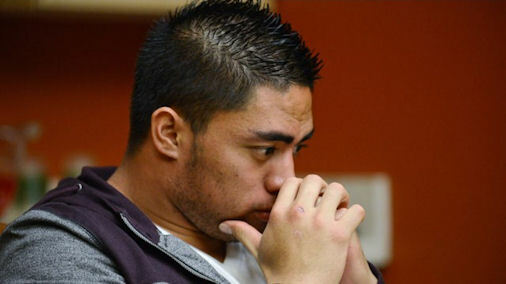 Manti Te’o was working with Tuiasosopo to orchestrate the hoax—for publicity. Te’o was in the running for the Heisman trophy, and the sensational details of the Lennay Kekua story (especially its over-the-top tearjerker qualities) would be enough to clinch it. Fake dead girlfriend + dead grandmother = Heisman. Except #oops. Manti Te’o is gay and was in a relationship with Tuiasosopo, who used Lennay Kekua to cover up their relationship. On top of attending one of the most conservative religious schools in the country, as a devout Mormon, while practicing a sport that’s never had an openly gay player, it makes sense that Te’o would want to hide his sexuality. You almost can’t blame him, except for that whole manipulating everyone thing. Even though Tuiasosopo has “set the record straight” (puns!) and has proven Theory #1 to be “correct,” I’m still confused. Call me a pessimist or a conspiracy theorist, but I’m calling bull on the Te’o story. I don’t have all the answers, and Te’o could very well be telling the truth (that he didn’t know about Lennay Kekua) but a lot of things don’t add up in his story. These are the problems I have with the official version, and I’m going to break them down, Law and Order-style. “It never felt like a chance meeting, although it probably appeared that way from the outside looking in. Their stares got pleasantly tangled, then Manti Te’o extended his hand to the stranger with a warm smile and soulful eyes. They could have just as easily brushed past each other and into separate sunsets. Te’o had plenty to preoccupy himself that November weekend in Palo Alto, Calif., back in 2009. “Lennay Kekua was a Stanford student and Cardinal football fan when the two exchanged glances, handshakes and phone numbers that fateful weekend three seasons ago. She was gifted in music, multi-lingual, had dreams grounded in reality and the talent to catch up to them. The plan was for Kekua to spend extensive time with the whole Te’o family when upwards of 40 of them came to South Bend in mid-November for ND’s Senior Day date with Wake Forest. 1. If Tuiasosopo was acting as Lennay without Te’o’s knowledge, how could Te’o have met her at that football game? Who did Te’o meet? Who was Te’o staring at? 2. How could Kekua have visited him in Hawaii? 3. How could they have had a chance meeting if Te’o also claims that he and Kekua were hooked up through his cousin? Manti Te’o “met” Kekua in 2009, and they dated for two years before making it “official,” which would have occurred in 2011. They then dated for a year before her “untimely” death in 2012. That’s a long time to acquaint someone you later end up dating without getting even a hug out of the deal. 1. For Tuiasosopo’s story to be true, Te’o would have to have never met her, or he would know the truth. So, if you’ve never met your girlfriend, wouldn’t you take this as an opportunity to actually meet her in person? If you are as in love as Manti Te’o claims he was, wouldn’t you want to say goodbye? 2. If Te’o planned on paying respects to her in Hawaii (which expected when your long-distance girlfriend dies, and doubly if you’ve never met her in person), he would have had to travel to meet her family and see the gravesite, both of which do not exist. One cannot have a family if one is not real. If he did go to Hawaii to mourn Kekua, who did he visit? What grave would he have gone to? And if he didn’t go, why? Did Kekua also conveniently insist that he never miss a practice? 3. Where did he send the roses and the picks to? If Lennay is dead and no one is around to receive them, where would they have gone? If they were received by a family member of Lennay’s, which don’t exist, wouldn’t Te’o have to call them? If Te’o did speak with one of Kekua’s fake family members, who would he have been speaking to? On an unrelated note, Ronaiah Tuiasosopo demonstrated the "Lennay Kekua voice" for Dr. Phil this week, which matched the voice from the messages she left Te&apos;o. How do we know that he was using that voice to dupe Te&apos;o and that the intended dupe wasn&apos;t other people? If you need a fake girlfriend, wouldn&apos;t it be helpful to have someone leaving voices on your answering machine that you can leak to the media later after she bites the Great Bucket in the Sky? Wouldn&apos;t it be helpful to have someone who would be able to speak to friends, family, teammates or reporters as Lennay? Just because Tuiasosopo does good voice work doesn&apos;t mean that Te&apos;o didn&apos;t know about it. Discuss. “Te&apos;o and Tuiasosopo definitely know each other. In May 2012, Te&apos;o was retweeting Tuiasosopo, who had mentioned going to Hawaii. Wrote Te&apos;o, ‘sole’—‘bro,’ in Samoan—‘u gotta come down.’ In June, Te&apos;o wished Tuiasosopo a happy birthday. How they know each other isn&apos;t clear. We spoke to a woman we&apos;ll call Frieda, who had suggested on Twitter back in December that there was something fishy about Lennay Kekua. She was Facebook friends with Titus Tuiasosopo, so we asked her if she knew anything about Ronaiah. 1. So, Kekua didn’t meet with Te’o at that Stanford game, and Tuiasosopo did. Then why would Te’o lie and say he did meet her? 2. Isn’t it a doozy that the night Te’o says that he met up Kekua for the first time is also the night he met up with Tuiasosopo, the guy who was pretending to be her? Coincidence? Kekua couldn’t have gone to Hawaii if she was a fake person who cannot travel, cannot buy a plane ticket and can’t complain about the airline food. However, on his Twitter account, Tuiasosopo mentions going to Hawaii. Tuiasosopo was also in a car wreck, when Kekua clearly was not, as she didn’t exist. If Te&apos;o didn&apos;t know that Tuiasosopo was Kekua, wouldn&apos;t he find it a strange coincidence that his friend just happened to be in an accident the exact same time as the girlfriend he never met? Wouldn&apos;t that prompt some questions? Discuss. “The hoax began crumbling around the edges late last year. On Nov. 4, 2012, an ‘U&apos;ilani Rae Kekua,’ supposedly Lennay&apos;s sister, popped up on Twitter under the name @uilanirae. A few weeks later, the @uilanirae account was deleted. The deletion came immediately after tweets from two now-suspended Twitter accounts had alleged that U&apos;ilani was a fraud, that the same person behind Lennay was operating the U&apos;ilani account, and that the images of ‘U&apos;ilani’ were really of a woman named Donna Tei. 1. Your girlfriend dies and her sister briefly pops up on Twitter. Why would you delete the tweets you sent to her after she deletes her account? If she really meant that much to you, would you save them or “favorite” them—to further preserve her memory? 2. Isn’t it interesting that Te’o deleted her tweets right after she was beginning to be exposed as a fraud? Why would he do that? What purpose would deleting your tweets about someone even serve, except to hide the fact that person ever existed? Manti Te’o admits that he lied to his father about meeting Kekua in person and that he “briefly” continued the charade after finding out it was a hoax. He refers to it as "tailoring" his story for the media, because "lying" is too accurate a word. If you&apos;re "tailoring" your story all over the media, "tailoring" so much that you can&apos;t keep your facts straight, "tailoring" so hard your dirty white tailors come out your ears and ears, wouldn&apos;t you be concerned about your girlfriend finding out about them? What would you expect her to say? Elsewhere, Manti Te’o referred to U’ilani in a tweet as one of the “realist” people he knows. 1. Why can’t he spell “realest” correctly? Also, does he know that’s not a word? 2. How can he say this with certainty if he’s never met her, only conversed with her on Twitter a handful of times and possibly hasn’t even spoken to her on the phone? 3. If Te’o did ever speak to her on the phone, who was he speaking with? Did Tuiasosopo have a voice for her, too? Let’s go with Te’o’s explanation that he discovered it was a hoax after Kekua "died." In his Katie Couric interview, he mentions he found out in December 6, one month after this tweet. Talk amongst yourselves. Friends close to Ronaiah Tuiasosopo and Manti Te’o said that they were “80 percent sure” Te’o was in on it. Discuss. Nico Lang blogs about LGBTQ life in Chicago for WBEZ.org. For more in ambiguously gay conspiracy theories, follow Nico Lang on Twitter @Nico_Lang or on Facebook.